King's Lynn Glass was founded in 1967 by glass designer Ronald Stennett-Willson. Two years later the company became part of the Wedgwood Group, and the factory was renamed Wedgwood Glass soon after, with Ronald as managing director. Wedgwood began producing glassware with a distinct Scandinavian style. Ronald Stennett-Wilson's most popular design was the Sheringham candlesticks, with disc shaped stems. Wedgwood acquired Galway Crystal in 1974, and soon after was renamed Wedgwood Crystal. Wedgwood bought a 50% share in Dartington Glass in 1982, and sold the stake to the Rockware Group in 1989. During this time, Frank Thrower, designer at Dartington, created several designs for Wedgwood, including the Brutus range. 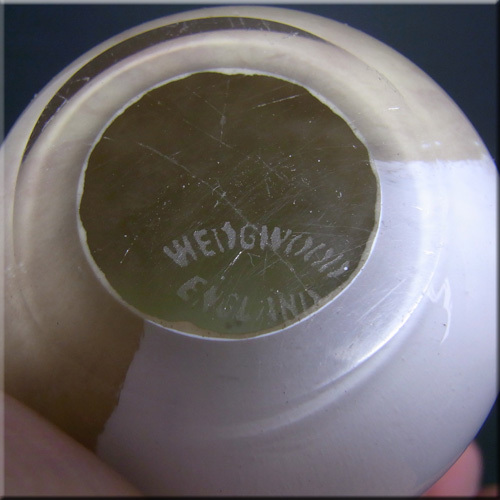 Wedgwood merged with Waterford in 1986, and was sold to Caithness Glass in 1988, being renamed Caithness Crystal. The factory closed in 1992. Wedgwood blue + green speckled glass vase, designed by Ronald Stennett-Willson, marked to base and labelled. Wedgwood blue + green speckled glass vase, designed by Ronald Stennett-Willson, marked to base. 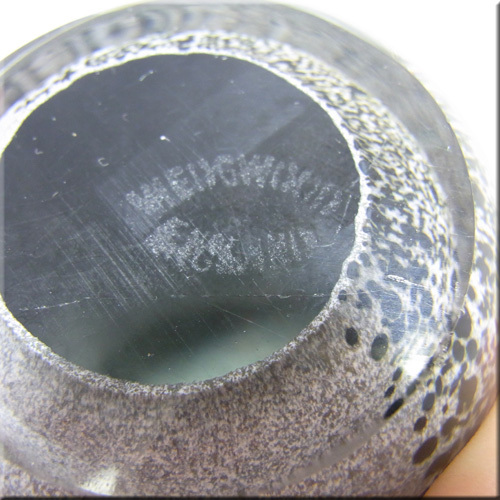 Wedgwood green cased glass bowl, designed by Ronald Stennett-Willson, pattern number RSW 27, part of the textured range, marked to base. Wedgwood clear glass 'Flame' tumbler, designed by Ronald Stennett-Willson, pattern number RSW 128-13, part of the textured range, marked to base. Wedgwood amber glass two hoop 'Sheringham' candlestick holder, designed by Ronald Stennett-Willson, pattern number RSW13, acid stamp to base. Wedgwood purple glass two hoop 'Sheringham' candlestick holder, designed by Ronald Stennett-Willson, pattern number RSW13, acid stamp to base. Wedgwood clear glass one hoop 'Sheringham' candlestick holder, designed by Ronald Stennett-Willson, pattern number RSW13, acid stamp to base. Wedgwood pink glass three hoop 'Sheringham' candlestick holder, designed by Ronald Stennett-Willson, pattern number RSW13. Wedgwood amber glass three hoop 'Sheringham' candlestick holder, designed by Ronald Stennett-Willson, pattern number RSW13. Wedgwood amber glass two hoop 'Sheringham' candlestick holder, designed by Ronald Stennett-Willson, pattern number RSW13, acid stamp to base. Wedgwood blue glass one hoop 'Sheringham' candlestick holder, designed by Ronald Stennett-Willson, pattern number RSW13, acid stamp to base. Kings Lynn pink glass two hoop 'Sheringham' candlestick holder, designed by Ronald Stennett-Willson, pattern number RSW13, labelled. Wedgwood pink glass two hoop 'Sheringham' candlestick holder, designed by Ronald Stennett-Willson, pattern number RSW13, acid stamp to base. Wedgwood green glass one hoop 'Sheringham' candlestick holder, designed by Ronald Stennett-Willson, pattern number RSW13, acid stamp to base. Wedgwood green glass two hoop 'Sheringham' candlestick holder, designed by Ronald Stennett-Willson, pattern number RSW13, acid stamp to base. Wedgwood blue glass two hoop 'Sheringham' candlestick holder, designed by Ronald Stennett-Willson, pattern number RSW13, acid stamp to base. Wedgwood purple glass three hoop 'Sheringham' candlestick holder, designed by Ronald Stennett-Willson, pattern number RSW13. Wedgwood purple glass one hoop 'Sheringham' candlestick holder, designed by Ronald Stennett-Willson, pattern number RSW13. Wedgwood blue glass three hoop 'Sheringham' candlestick holder, designed by Ronald Stennett-Willson, pattern number RSW13. Wedgwood green glass three hoop 'Sheringham' candlestick holder, designed by Ronald Stennett-Willson, pattern number RSW13. Wedgwood topaz (amber) glass one hoop 'Sheringham' candlestick holder, designed by Ronald Stennett-Willson, pattern number RSW13, acid stamp to base. Wedgwood clear glass two hoop 'Sheringham' candlestick holder, designed by Ronald Stennett-Willson, pattern number RSW13, acid stamp to base. Wedgwood clear glass one hoop 'Sheringham' candlestick holder, designed by Ronald Stennett-Willson, pattern number RSW13, labelled. Wedgwood purple glass one hoop 'Sheringham' candlestick holder, made for the Queens Silver Jubilee. Designed by Ronald Stennett-Willson, pattern number RSW13, acid stamp to base. Wedgwood green glass one hoop 'Sheringham' candlestick holder, designed by Ronald Stennett-Willson, pattern number RSW13, acid stamp to base. Wedgwood topaz (amber) glass one hoop 'Sheringham' candlestick holder, designed by Ronald Stennett-Willson, pattern number RSW13, acid stamp to base. Wedgwood pink glass 'Sandringham' candlestick holder, designed by Ronald Stennett-Willson, pattern number RSW22, acid stamp to base. Wedgwood blue glass 'Sandringham' candlestick holder, designed by Ronald Stennett-Willson, pattern number RSW22, acid stamp to base. Wedgwood green glass 'Sandringham' candlestick holder, designed by Ronald Stennett-Willson, pattern number RSW22, labelled + boxed. Wedgwood purple glass 'Sandringham' candlestick holder, designed by Ronald Stennett-Willson, pattern number RSW22, acid stamp to base. Wedgwood pink glass 'Sandringham' candlestick holder, designed by Ronald Stennett-Willson, pattern number RSW22. Wedgwood green glass 'Sandringham' candlestick holder, designed by Ronald Stennett-Willson, pattern number RSW22. Wedgwood smokey glass 'Brutus' flower vase, designed by Frank Thrower. Wedgwood smokey glass 'Brutus' flower vase, designed by Frank Thrower. Wedgwood pink glass 'Brancaster' candlestick holder, designed by Ronald Stennett-Willson, pattern number RSW15, acid stamp to base. Wedgwood amber glass 'Brancaster' candlestick holder, designed by Ronald Stennett-Willson, pattern number RSW15, acid stamp to base. Wedgwood blue glass 'Brancaster' candlestick holder, designed by Ronald Stennett-Willson, pattern number RSW15. Wedgwood green glass 'Brancaster' candlestick holder, designed by Ronald Stennett-Willson, pattern number RSW15. Wedgwood amber glass 'Brancaster' candlestick holder, designed by Ronald Stennett-Willson, pattern number RSW15, labelled. Wedgwood large orange glass bowl, acid stamp to base. Wedgwood smokey glass 'Brutus' flower vase, designed by Frank Thrower, acid stamp to base. Wedgwood smokey glass 1980's 'Orson' vase, designed by Frank Thrower, 5 inches (125mm) tall, pattern number FJT5/2, acid stamp to base. Wedgwood smokey glass 1980's 'Ming' vase, designed by Frank Thrower, 5.5 inches (140mm) tall, pattern number FJT43/2/M. Wedgwood smokey glass 1980's 'Orson' vase, designed by Frank Thrower, 4 inches (100mm) tall, pattern number FJT5/1, labelled. Wedgwood amber glass bear paperweight, unmarked. Wedgwood multicoloured glass paperweight, acid stamp to base. Wedgwood speckled grey glass squirrel paperweight, unmarked. Wedgwood amber glass whale paperweight with rounded head, acid stamp to base. Wedgwood green glass bird paperweight, acid stamp to base. Wedgwood amber glass whale paperweight with flattened head, acid stamp to base. Wedgwood amber glass dolphin paperweight, acid stamp to base. Wedgwood blue glass dolphin paperweight, acid stamp to base. Wedgwood lilac glass seal paperweight, acid stamp to base. Wedgwood amber glass seal paperweight, acid stamp to base. 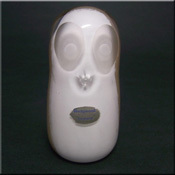 Wedgwood amber glass penguin paperweight, acid stamp to base and labelled. Wedgwood amber glass bird paperweight, acid stamp to base and labelled. Wedgwood blue glass bird paperweight, acid stamp to base and labelled. Wedgwood green + blue speckled glass bird paperweight, acid stamp to base and labelled. Wedgwood green speckled glass bird paperweight, acid stamp to base. Wedgwood pink speckled glass bird paperweight, acid stamp to base. Wedgwood white + brown speckled glass owl paperweight, acid stamp to base. 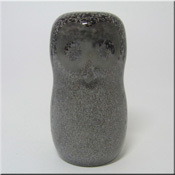 Wedgwood grey + black speckled glass owl paperweight, acid stamp to base. Wedgwood brown speckled glass owl paperweight, acid stamp to base. Wedgwood amber glass seal paperweight, acid stamp to base. Wedgwood clear glass bird paperweight, acid stamp to base. Wedgwood brown speckled glass bird paperweight, acid stamp to base. Wedgwood amber glass snail paperweight, acid stamp to base. Wedgwood amber glass dolphin paperweight, acid stamp to base and labelled. Wedgwood amber glass rabbit paperweight, acid stamp to base. Wedgwood amber glass rabbit paperweight, acid stamp to base. Wedgwood pink speckled glass bird paperweight, acid stamp to base and labelled. Wedgwood amber glass duck paperweight, acid stamp to base. Wedgwood amber glass penguin paperweight, acid stamp to base. Wedgwood amber glass duck paperweight, acid stamp to base and labelled. Wedgwood green speckled glass elephant paperweight, acid stamp to base. Wedgwood amber glass squirrel paperweight, labelled. Wedgwood amber glass dog paperweight, acid stamp to base and labelled. Wedgwood amber glass otter paperweight, acid stamp to base + labelled. Wedgwood amber glass pig paperweight, acid stamp to backside. Wedgwood amber glass elephant paperweight with raised trunk, acid stamp to base. Wedgwood amber glass elephant paperweight with lowered trunk, acid stamp to base. Wedgwood smokey grey glass whale paperweight with rounded head, labelled.